FBI Cracks Down on Gangs at L.A.'s MacArthur Park The LAPD and FBI have teamed up to target the gang stronghold in a Los Angeles park. Federal agents are able to pay more for informants and provide more intelligence surveillance and wiretaps — resulting in fewer murders. The park is an oasis from the surrounding urban neighborhoods. Latino immigrants began moving to the area in the 1980s, fleeing civil wars in Central America. 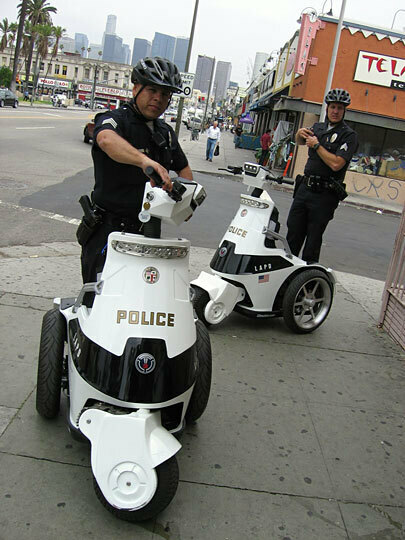 LAPD officers Miguel Lopez (left) and Sgt. Ryan Schatz patrol the park on new three wheeled "T-3" vehicles. 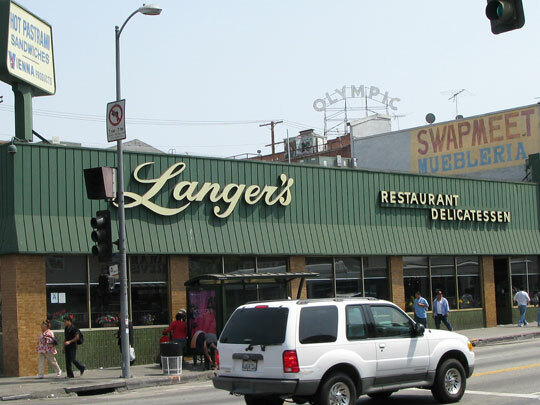 Langer's Deli, which has sold famous pastrami sandwiches for more than 60 years, nearly shut down because of gang violence. Efrain Castellanos, better known as "Pictureman," has been taking Polaroids at the park for 37 years. Gangs used to charge him "rent" in exchange for protection, he says. Every month, Romero gathers activists, artists and police in a group called "Rediscover MacArthur Park." They plan catered family events to entice people ot the neighborhood — "fighting crime one tamale at a time." 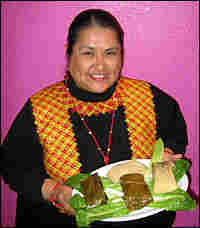 Sandra "Mama" Romero runs Mama's Hot Tamales, a popular restaurant across from the park. MacArthur Park has long been a Los Angeles icon, due in part to Donna Summer's disco hit bearing the park's name. It was also the scene of last year's "May Day melee," during which police officers beat families and news reporters during an immigrants' rights rally. In the past few decades, it's also been a gang stronghold — with at least four street gangs claiming turf and drug trade in and around the park. The bitter rivalries used to turn the park into a scene of violent, sometimes deadly crimes. But lately, a joint Los Angeles Police Department-FBI crackdown has put a major dent in gang dominance over the area. In a four-part series, NPR takes a close look at street gangs, why gang violence is increasing and new ways to combat them. Part 1 discusses the cooperation between the FBI and LAPD to combat gang violence in the Watts neighborhood of L.A. Here in Part 2, NPR dissects the evolution of gang violence in MacArthur Park. If you're looking for a fake I.D., MacArthur Park is the place to go. And even if you aren't looking, the street dealers will come looking for you. 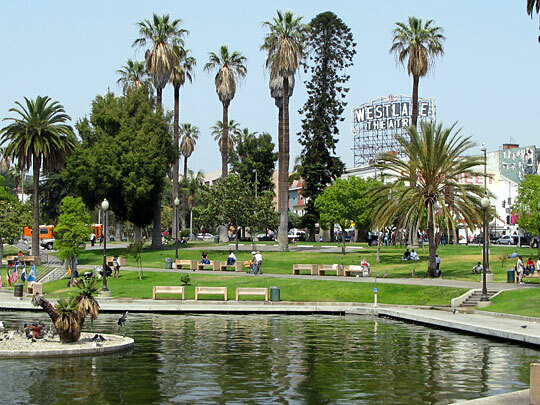 It's a gritty area, but you can still see the beauty of the MacArthur Park that used to be: a neighborhood with a lake and lots of paddle boats, surrounded by nice high-rise apartment buildings. That's the place Norm Langer remembers. "Primarily it was a Jewish recreation area," he recalls from inside the deli his father opened 61 years ago. Today, he runs Langer's Deli and sells its famous pastrami sandwiches. MacArthur Park was out of control and the gangs were running it, says LAPD Homicide Capt. John Egan. "One year, we had almost 106 homicides in eight square miles," he says from the intersection of 7th Street and Alvarado. Egan still remembers investigating a homicide and hearing shots fired three or four blocks away where another murder was happening almost simultaneously. "There would be robberies, shootings, stabbings in the park, drug sales by the gang members," he says. "We would play cat-and-mouse with them." In the 1980s, immigrants started moving into the neighborhood, fleeing bloody civil wars in Central America. Alex Sanchez arrived from El Salvador as a teen and soon joined a street gang that became known as the MS-13 — the Mara Salvatrucha. Sanchez says they fought over turf with rivals in the 18th Street gang, the Wanderers and the Crazy Riders. Through the 1990s, the gangs fought bitterly over control of the drug trade. Longtime residents Sandra Romero and Alex Alonso remember how violent MacArthur Park was in those days. "It was considered one of the most drug-plagued communities in the United States," Alonso says. "It was the haven for all the gang members and drug dealers," Romero recalls. "They were involved in drug dealing, murder, people smoking crack, prostitution in little rolling brothel vans." Alonso adds: "It looked like Beirut, Lebanon, in that area." Gang members demanded that local drug dealers and small-time food vendors pay protection. 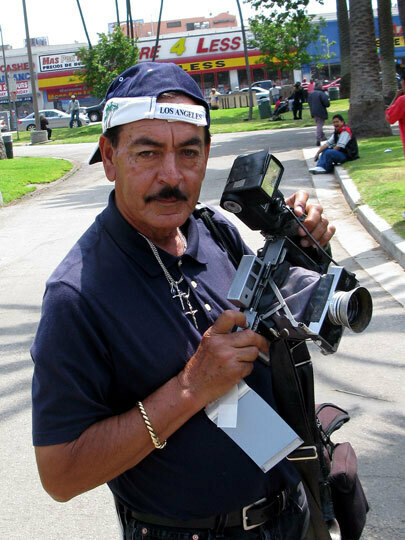 Efrain Castellanos has been taking Polaroid pictures of people in the park for 37 years. He's known as "Pictureman." Castellanos says he also was threatened by the gangs, who used to collect $20 from him each week. He says they told him if he "didn't pay rent, be careful." Castellanos says he was afraid if he didn't pay them, they would shoot him, which is what happened to one street vendor selling DVDs last fall. Police have arrested six members of the Columbia Lil Cycos clique in the death of a 23-day old baby who was shot by a stray bullet in that incident. A decade ago, L.A. police officers from the local Rampart division's anti-gang unit got caught in a massive corruption scandal. Cops were accused of framing and shooting gang-bangers and stealing their drugs to sell them. More than 70 officers were implicated, and for a time, the gang unit was disbanded. Former MS-13 member Alex Sanchez says MacArthur Park was caught in the middle. "People that lived in that community were frightened of law enforcement, and were frightened of the gangs," he says. But Rampart division Capt. Egan says things changed after William Bratton took over as LAPD chief in October 2002 and began a partnership with agents from the FBI, the Bureau of Alcohol, Tobacco and Firearms, the Drug Enforcement Administration and Immigration and Customs Enforcement. "We really wanna go after the higher-ups in the organization, the so-called shot callers," Egan says. "So we were actually able to take quite a few individuals off streets." Egan says federal agents are able to pay more for informants and provide more intelligence surveillance and wiretaps. And they're able to prosecute under federal statutes that carry stiff sentences. "It's been a real help to us having them involved because they bring all kinds of other resources and ability to access intelligence," Egan says. "When the feds get involved, when the FBI gets involved, you're looking at serious time on those charges." Gang injunctions by Los Angeles' city attorneys continue to authorize police to arrest gang members who are seen together in public. And federal immigration agents regularly deport undocumented gang members with felonies. FBI and Los Angeles police officials admit the city's gang violence has been exported. In fact, prisons in El Salvador, Honduras and Guatemala are filled with deported gang members from Los Angeles. As a result of all of these efforts, Egan says, the number of homicides has been declining since the high mark of 106 murders in one year in the Rampart police division more than a decade ago. To date, there have been five homicides this year. 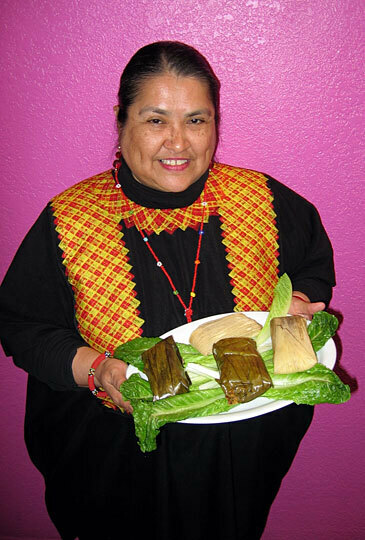 Mama's Hot Tamales is a popular new restaurant across the street from MacArthur Park. Sandra Romero, who is Mama, has hired the food vendors who are no longer allowed on the streets. Every month, Romero gathers artists, activists and police at her restaurant for a group called Rediscover MacArthur Park. They plan catered art shows and concerts to entice people back to the neighborhood. "We've served over a thousand tamales to the community to show the world we're in solidarity with the LAPD to make our neighborhood the best it can be," says Romero, who says the community has taken back their park by "fighting crime one tamale at a time." New video surveillance cameras now monitor the entire park. 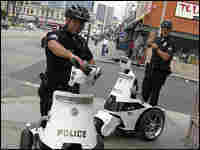 And patrol officers roam around on new three-wheeled police vehicles. Police Sgt. Ryan Schatz and his partner say since gang violence is down, they're left to pursue less violent crime, such as giving citations to illegal fruit vendors. Now the once-ubiquitous Alex Sanchez, who runs the gang intervention group Homies Unidos, fears that with the clean-up effort something else has been lost: some of the flavor of the immigrant community. Sanchez says local and federal policing has just pushed gang violence to other parts of the city and outside the country to Central America. Sanchez points to the newly-converted lofts around the park area that are driving up rents. That's what's driving the new effort to clean up MacArthur Park, he says. "The park is changing, it's being gentrified," he says. "And the community that went through all those years of suffering are being told to move out. We feel we're losing our home that we made away from home."